LibraryThing’s Mike Topper has just pushed a big change in how members share their LibraryThing news on Facebook. The change—integrating into Facebook’s Open Graph structure—makes the things you share more visible to your friends and integrates them more cleanly into your Facebook timeline. If you haven’t already, connect your LibraryThing account to Facebook on the Sites/apps page (and be sure to say “yes” when Facebook asks if you want to grant us permission). 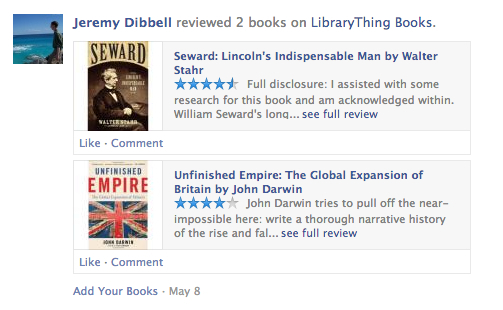 Please note: LibraryThing never shares with Facebook without your explicit consent. There are various places you can share, usually marked with the “share” icon ( ). Sharing is always available at the top right of the site. We also enable members to share to Twitter. Here’s what the new sharing action for reviews looks like from within Facebook. Facebook will also aggregate multiple instances of an action together and display that to your friends. We’ll be rolling out more of these types of actions moving forward, so stay tuned. Many thanks to the members of the Board for Extreme Thing Advances who helped us out with testing these changes. It annoys me perhaps a stupid amount that ‘booklovers’ is one word in those posts. Book lovers! Two words! PS The changes look fantastic! 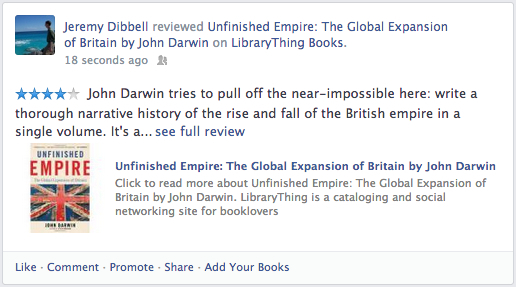 I’m not really getting this whole share with FB thing – is it up and running? I (supposedly) am linked to my facebook but touching that icon doesn’t DO anything does it? Also I find that I may want to take some discussion on FB and route it back to LIBRARY Thing … that would be neat because I recently put notes in FB Anne Frank (today is her birth) and so on. It would be cool to just make that go to a library T discussion. I’d like to share whole lists of books my kids have read with other moms and friends. Is that possible? I’ve tried to send a direct link to a category but that doesn’t work.